A few weeks ago, one of my clients reached to me for support. Her child had been exposed to a toy that scared him. The toy gave him nightmares. A google search on how to help your child go through nightmares will give you some common sense tips: show empathy and understanding. 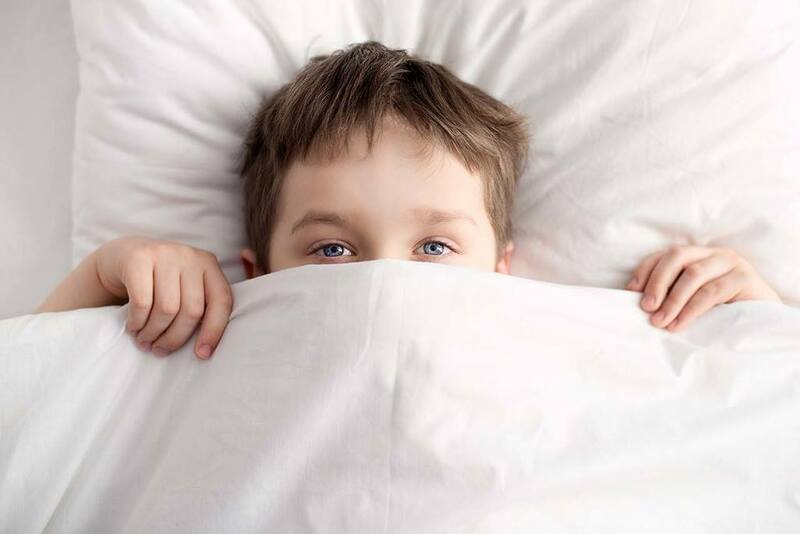 Don’t dismiss the impact that bad dreams can have on your child. Unfortunately, many of the tips are inappropriate. The use of a “monster spray”. Reward charts for each night your child has been brave enough to sleep on his own despite having nightmares. Or even worse, setting up clear limits, such as “no crying or calling at bedtime”. As parents, nightmares are uncomfortable to handle. Your child was a good sleeper. Suddenly, your peaceful evenings are disturbed. It’s also natural to want to keep pain and fear away from your children. After all, we are here to protect our children and keep them safe. The idea of using a magic spray to calm our little one is tempting. And yes, it will work for many children. However, the relief will only be temporary. Once this trick doesn’t work anymore, what kind of magic will you have to perform to reassure your child? Maria Montessori understood that young children were learning about the world around them through their hands-on experience. Children understand reality. Fantasy is meaningless for them. On top of that, children are very credulous. There is an evolutionary explanation to their naive trust in their caregiver. Our children are very fragile. They depend on us for all their basic needs. They must trust us. Imagine you and your child are both in a life-threatening situation. You are both facing a tiger. You decide to escape. If your child started to question your decision and decide to play with the tiger, she would be in real trouble. Indeed, without this naive trust that our children have in us, humanity wouldn’t have made it to the present times. With that in mind, we need to be very mindful of the power we have over our children. I never pretend that there are only gentle monsters under the bed, or that a magic spray with glitter and pink colouring will make everything better. Because I don’t like to abuse my child’s credulity. I want my relationship with my children to be based on trust. Dreams are a way for children and grown-ups to process their emotions. We dream to handle the experiences we have lived during the day – positive and negative. When children become more “conscious”, they start to have more vivid dreams. This happens around the age of 3, when their néocortex develops. They might wake up crying and frightful of what they just dreamed about. As it’s a new experience, they don’t have the vocabulary and understanding to comprehend and tolerate what has just happened. Even as adults, nightmares can shake us up. We know it was only a bad dream, yet we still feel uneasy in the morning. I myself have regular vivid dreams. I often wake up crying and screaming. Needless to say, I don’t like it! Now imagine how a little toddler might feel. 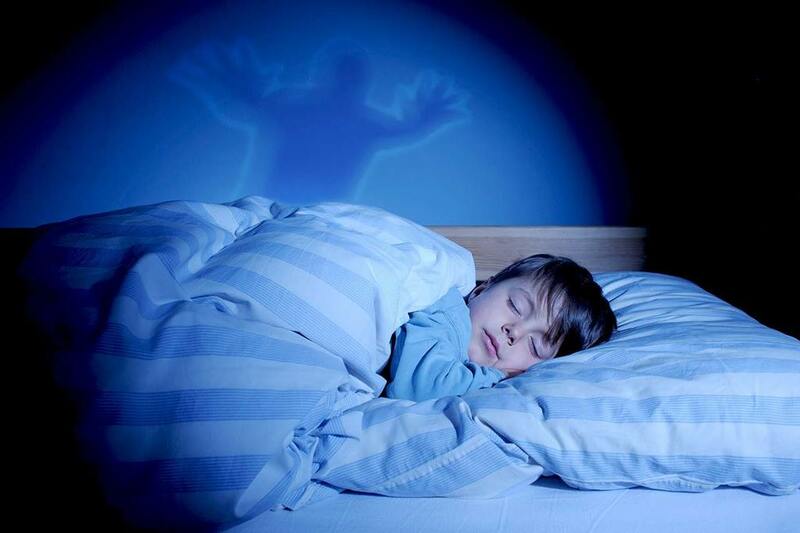 What do I recommend when your child is having nightmares? First, show empathy to your child. State what has just happened: “you woke up crying because you were having a dream”. I am not a fan of using the words “nightmare” or “bad dream” with our children. That implies that those dreams are “bad” or “frightful”. Children are afraid because they don’t know what is happening. They don’t get yet that dreams are not real. When my children were very young and having nightmares, I would stay with them and comfort them until they fell back asleep. I let them sleep with me for the night if it was necessary. I would carry on with our sleeping routine the next day as usual. My son is more prone to nightmares than my daughter. In fact, I had to interrupt the writing of this article to help him settle as he was afraid to have a nightmare. He’s currently 7. Since he was 4, I’ve been explaining to him in very simple terms what a dream is. It’s best to be honest and factual when your child goes through some unpleasant experiences. I’ve talked my children through their first visit to the dentist and the hair dresser. I’ve also talked my son through his first visit to an emergency room where he had to have few stitches! Here is how I talk about dreams to my children: during the night, our brain must tidy up all the activities we did that day. It plays a movie in our head that we watch while we sleep. Sometimes it’s funny, sometimes it’s weird, sometimes it’s scary. When my children share their nightmares, we talk about them in a factual way. "You were dreaming that you were alone in the swimming pool. Were you afraid? What were you afraid of? Oh, you were afraid of not being able to swim… Where was your teacher? Oh, that was a new swimming pool… I see. Remember, it’s like a movie. In the same way that you can switch off the television, you can always wake up. The dream will be over." I always tell my son that he can come to my bedroom if he wakes up and wants to be comforted. He is now 7 but he is still very welcome. It’s not rare to find him in our bed when we wakes up. If he struggles to fall asleep, I ask him what would help him. It’s important to help your child to be in control and to find his own solutions. Extra cuddles, a teddy, an extra story, reading by himself and an extra light have helped. So far, I have approached each “bad dream” event with a casual and relaxed attitude. I’ve also been careful not to turn nightmares into a power and control situation. My children don’t have more attention because they have a nightmare. They can sleep in my bed any night. Nightmare nights are not special nights. They can also have extra cuddles at any time. Although I will comfort them, having nightmares doesn’t mean more cuddles. They can come to my bed if they’re having a disturbing dream. I will carry on with our bedtime routine the next day, as if nothing happened. I haven’t yet felt the need for a magic trick! I have also share some books recommendations to read to your child, about how to cope with the darkness and nighttime. Check here.